World Bank back to Cambodia? Evictees and affected families of Cambodia's Boeng Kak and Borei Keila neighborhoods have called on the World Bank to leave Cambodia, as lending programme resumes. 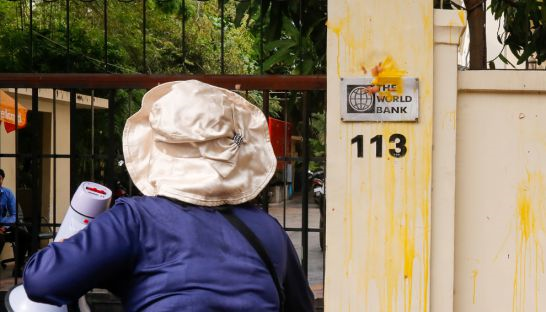 In February, the English language newspaper the Cambodia Daily reported that approximately 40 protesters had hurled eggs at the front gate of the World Bank’s Cambodia headquarters in the capital, Phnom Penh. They vowed “we will come back here every Monday to throw chicken eggs until [the Bank] leaves Cambodia”. The protesters were current residents and evictees from Phnom Penh’s Boeng Kak and Bo­r­ei Keila neighbourhoods and blame the Bank for funding a land titling project they claim forced them and some 3,000 families out of their homes in 2007 to make way for a high-end real estate project (see Observer Autumn 2015). The World Bank froze all new lending to Cambodia in 2011 over the controversial Boeng Kak evictions. The paper reported the Bank is now preparing to resume programming with another $25 million loan to Cambodia, possibly in a matter of months, for phase two of the major land titling project involving the same areas affected between 2007 and 2015 by the first phase of the Bank programme, as well as new sites in the north of Kompong province. In response, evictees and affected families called on the Bank to leave Cambodia. Sie Nareth, one of the evictees of Boeng Kak, commented “We don’t need the World Bank be­cause it violates human rights and the land of the Khmer people. If the World Bank stays, many more families will suffer”.